New book, 185 pages. Squadron Leader Frank Korbl (Retd) was born in Vienna, Austria. His colourful career included wartime service with the German Air Force and post-war employment with the British NAAFI in Germany and Austria. He migrated to Australia in 1956 and joined the RAAF in 1956, being commissioned into the Equipment Branch. He served at a number of RAAF units including No.9 (Helicopter) Squadron in Vietnam. He was awarded the MBE in 1977 for his services as Senior Barracks Officer at RAAF Richmond NSW. 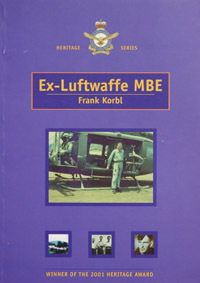 In his book 'Ex-Luftwaffe MBE', the author traces his training as aircrew wireless operator and rear gunner, the trials and tribulations of four years war service, the defeat of Germany in 1945 and his short spell as a Prisoner-of-War. The story of his service with the RAAF contrasts with that of his involvement in World War II, providing an interesting insight into the different cultures of two military organisations, by giving examples of training, procedures and life in general. It is not only a remarkable story from a military point of view but also an inspiring account of the migrant experience in the Australian environment.